North latitude: 49° 54' 56"
East longitude: 14° 47' 22"
The observatory is in the area of Prague integrated public transport (PID). There are bus lines from Prague to Ondřejov departing from Hostivař metro station. It is necesarry to change in Mukařov to Chocerady direction. 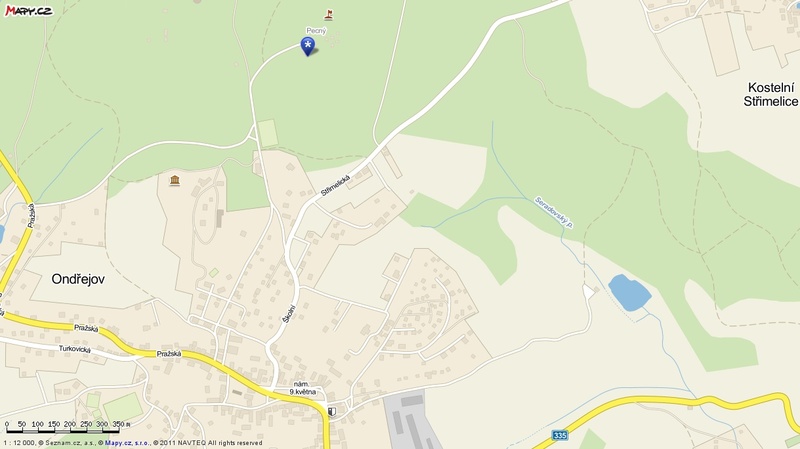 From Ondřejov main square, you will walk approximately 15 minutes to the highest hill Pecny in the neighborough of the Astronomical observatory. However, the most easy access is by car. Exit highway D1 Prague-Brno in Mirošovice (exit 21) and follow direction to Mnichovice. On the first main cross-road in Mnichovice turn right and follow direction to Ondřejov. Entering Ondřejov follow the steep cobbled road left up to the hill, where sign G.O.Pecny; shows the last turning to the Geodetic observatory Pecny. The car route from D1 highway to Pecný is displayed on the map.